Soggiorno Fortezza Fiorentina i Firenze, Italien: Reservér nu! Cancellations must be made at least a week before even if fewer people would otherwise be charged the first night. The Soggiorno Fortezza Fiorentina is a small family run B&B; it is located on the third floor of a building (there is the elevator). It is only 400 metres walking distance from the central train station in Florence (Firenze Santa Maria Novella) and just 200 meters walk from the exhibition center of the Fortezza da Basso and Firenze Fiera. From the B&B it takes only 15 minutes to walk to the cathedral square (the Duomo) and from there go around exploring Florence. Soggiorno Fortezza Fiorentina is outside the restricted traffic zone so you can drive without problems. The park 'Cascine' and the new Opera House are within easy walking distance. 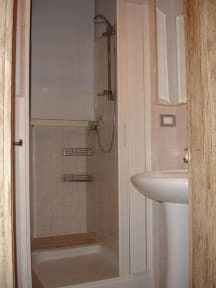 Massimo and Marisa (the new owners from January 2015) offer their guests 4 bedrooms, each decorated with its own style; all the rooms are with shared bath; there are two full bathrooms for the guests (bathrooms have a special automatic hygienic system). In the room you will find: tv, table with chairs, hairdryer, linen and towels, toiletries, electric kettle, central heating, air conditioning. In the common area it is possible to use also a microwave. The wifi is free in all the rooms and in the common area. Our breakfast is a self-service breakfast; you can prepare it yourself. You will find in the room: packaged croissants, biscuits, jam, fruit juice, sugar, tea, coffee, coffee creamers. You can cancel your reservation for free until 3 days before the day of your arrival. In case of late cancellation or no show we will charge the amount of one night every two booked. It is possible to check in from 11am until 1 pm and from 3.30pm until 6.30pm. On Saturday and Sunday it is possible to make the check in only in the morning from 11am until 2 pm. The check out time is at 10.30 am. 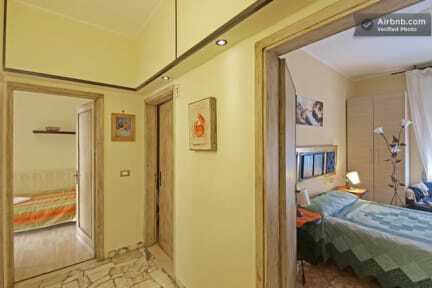 City tax is 2,50 Euros per person per night. Please note the city tax is not included in the room rate and you have to pay it at the check in.